GET OFF THE PLANE & GO!! 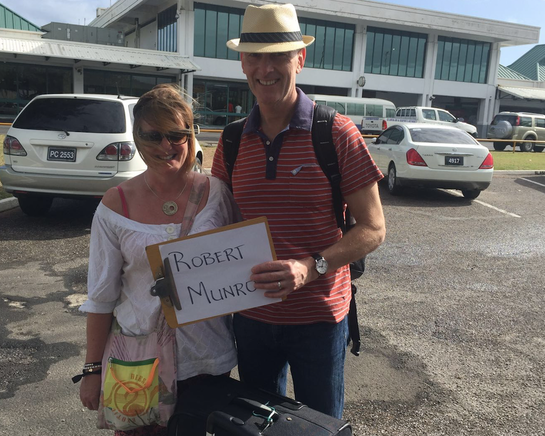 Most St. Lucia airport transportation provides you with a trip along the island’s east coast to your hotel, resort, or villa. While this can certainly be a great way to take in some beautiful views, the Arrival Expo offers you the chance to see and experience so much more via the west coast (Pitons - Anyone!!?). Worried that you might be too tired after your flight to enjoy all that a tour has to offer? With the Arrival Explorer, there is enough adrenaline boosting excitement to ensure that you have the time of your life. Visiting St. Lucia is exciting, to be sure, but knowing how to make the very most of your trip to the island is important. After all, how many opportunities do you really have to visit such an island paradise? With the Arrival Expo, you can make sure you start capitalizing on all that St. Lucia has to offer from the very first moment you step foot on the island. With this fully customizable, guided tour, you can experience the best of St. Lucia right on your arrival day- giving you the perfect start to your trip and helping you discover what sights and activities you might even want to explore more in-depth or do again. ​Whether you want to tour the only drive-in volcano in the world, take a hot mud bath in the mineral pools, visit the ancient and historic town of Soufriere, explore the Pitons from incredible vantage points, or take in the very best dining in St. Lucia, the Arrival Expo is just what you need- and it includes complimentary alcoholic or non-alcoholic beverages to help satiate your thirst. Professional Real St. Lucia Guide. One of the best aspects of the Arrival Expo is that it is fully customizable. That means that if there are stops or adventures that you would like to add to the trip, all you have to do is let us know. You will find that the Arrival Expo is led by a professional tour guide who is native to St. Lucia and who can answer any questions you may have about the island and its many attractions. All of our tour guides are fully dedicated to making your St. Lucia experience one that you will want to relive again and again, and this commitment shows in every step of your experience, from the moment you call to book or ask questions until after your tour is over. While we can meet you at any dock, port, or location on the island, most travelers arrive in St. Lucia through Hewanorra International Airport. From here, we will drive northward, making exciting stops in Soufriere, the island’s incredible historic former capital as well as viewing the magic in our relaxing caribbean waters. From various points soak in the St. Lucia sun, but you can take photos of majestic attractions and take in a unique and photogenic view of the Pitons. There are few things in the world as incredible as the views around the island of St. Lucia. While the Arrival Expo may be a short tour in terms of time, it is not short on opportunities for amazing photographs. From the breathtaking Pitons and beautiful beaches to the drive-in volcano and the island’s incredible waterfalls, you can channel your inner Ansel Adams as you capture some of the most amazing sights in the entire world. The photo opportunities aren’t limited to the island’s major attractions, either. Aspiring photographers and travel enthusiasts alike will want to capture everything from the island’s breathtaking foliage to the unique architecture and the intriguing daily life found in St. Lucia’s villages and towns. While flying to any destination can be exhausting, we believe that arriving in St. Lucia should be an exhilarating experience. To help ensure that this is the case, the Arrival Explorer is packed with adventure. From driving into a volcano to taking a dip in a relaxing medicinal mud pool, there is always a once in a lifetime opportunity awaiting you on this tour. The last thing we want is for you to arrive on the island and quickly make your way to your accommodation when there is simply so much to be seen and experienced! While the stops and attractions are certainly the highlights of the Arrival Expo, we make sure that every moment of your trip is incredible. This means providing you with a drive that is anything but boring. Our private, air conditioned tour vehicles will take you to some of the most picturesque scenery the island has to offer, from the famed Government House as seen from atop Morne Fortune to quaint, exciting fishing villages that are steeped in St. Lucian history and tradition. Before the Arrival Expo comes to a close, you will have the opportunity to see Castries, which is the current capital of St. Lucia. Located on the northern side of the island, this historic town has much to offer and is a great way to end a welcome tour of the island. Take a walk and enjoy local, native music as you walk along Derek Walcott Square, which takes its name from the famed poet laureate of St. Lucia. Inquire Today and We Can’t Wait to See You!